Imagine that you are sitting at a rustic cafe in in the South of France.. The soft wind wafts over you, scented with the smell of lavender and pine; an accordion plays softly in the distance and out of the corner of your eye you can see the azure shades of the sea. The jolly innkeeper bustles up and brings a plate on which is placed the perfect crepe! The delicate crust folded over, stuffed with strawberries, bananas, and cream; lightly drizzled over with chocolate syrup. You reach over with your spoon, and fill your mouth with a large bite .. of paradise..
Wouldn’t you like to recreate that at home? With the best electric crepe and pancake maker reviews here, you will soon be cooking that perfect crepe in the comfort of your home. Whether you like them sweet or savory, we’ve got your bases covered. We can’t help you with the rest of that French scene. But what is the best electric crepe maker to buy for home use? First, a griddle and crepe maker in one gives you better value, so you can also make regular pancakes, fry eggs and bacon, make tortillas, and more. The best crepe makers are easy to clean and use. They should be able to heat up quickly, have no surface hot spots and cook the crepes and pancakes evenly and quickly. If you’re not interested in making crepes but need something for everything else, then invest in an electric countertop griddle. If waffles are more to your liking, have waffle makers that come with removable plates that switch out to pancake plates or grill plates or griddle plates. But for now, let’s get to the electric crepe makers that we think are great buys. The CucinaPro Crepe Maker and Non-Stick 12″ Griddle is a neat looking electric griddle. It has a matte black finish, with a 12 inch cooktop – large enough for a decent sized crepe. The controls are simple enough – 5 heat settings, an on/off light and a ready light that indicates when the cook top has reached the desired temperature. The aluminum cook-top is coated with a non-stick material, and can be wiped clean after use. This cooker also comes with a wooden batter spreader, which can be used to spread the batter evenly over the cooktop so that you get a nice thin pancake. The pancake maker sits on rubber feet so that it sits firmly on your counter. The Cucina Pro comes with a few basic recipes; however you can find hordes of recipes online that should have you making crepes like a pro in no time! You can also use it as a griddle to make pancakes and fry eggs. Users of the Cucina Pro have been universal in their praise of its simplicity and consistent performance. People particularly like the fact that it can be wiped clean; and others also commend the little rim around the edge that prevents a runny batter from flowing over the edge of the cooktop. On the negative side, some people have complained that the cooker gets just too hot for normal use and that you should never use it at a setting of more than 2. Others believe that the batter spreader is a bit too big and works better if you chop of a bit from both ends of the T shaped spreader. However, all in all, this electric crepe griddle is great value for money and is definitely worth having in your list. The Nutri-Chef comes in two versions: The 1 griddle edition, and the 3 griddle edition. The 1-griddle version of the Nutri-Chef is a light and compact electric crepe maker. Although it comes in a small package, it proves the old adage “good things come in small packages”! In spite of its compact frame, it has a 12 inch cooktop, and includes a powerful 1200 watt heating element that is controlled by a rotary heat control knob, so you can vary the temperature continuously to fit your requirement. It also has an on/off light and a ready light that indicates when desired temperature has been reached. It has a non-stick aluminium cooking surface that can be wiped clean after use, and comes with a small wooden batter spreader as well as a wooden spatula, so you don’t have to go shopping for these items after you buy the griddle. And of course, you are not restricted to making crepes – the Nutri-chef is perfect for making other items such as omlettes and tortillas, or even dosas if you are in the mood for something different. The Nutrichef 3 griddle edition is a bit heavier and perhaps not as portable as the 1 griddle edition, but it comes with a base cooktop (used for cooking crepes) along with 2 removable non-stick griddle plates! The electric crepe pan is just as good at making crepes as the 1-griddle edition, while the first removable plate is perfect for making mini-pancakes, and the other is great for grilling your meats or veggies. The cooktop is a tad smaller than 12 inches, and the device is powered by a 1000 watt heating element that is controlled by a rotary temperature control. The Nutri-chef 3 griddle edition has a solid stainless steel construction and comes standard with a wooden spatula and a batter spreader. Users of the Nutri-Chef have appreciated the fact that you get both a spatula and a batter spreader along with the crepe maker and other users have given it high praise for its simplicity and utility. Users of the 3 griddle version have also commented on the ease with which perfect mini-pancakes can be made, using the removable mini-pancake griddle. It’s the best crepe maker for those looking for more versatility. However, some users of the 1-griddle version have remarked that the shielding under the device is not particularly effective, so the surface on which it is kept gets quite hot, and could possibly be damaged by the heat. Here is the veritable queen of crepe makers! The Morning Star Crepe Maker Pro comes with a large 13 inch cooktop that is ideal for making crepes, pancakes, omelettes, dosas; and is great for heating up readymade tortillas too. The surface is non-stick and can be wiped clean with a damp towel. The crepe maker comes with handles conveniently placed on the sides, so that it can be easily lifted sideways for washing with a carefully directed flow of water if needed. The handles also make it easy to carry around. The temperature is controlled by a rotary knob and there is a power light plus an indicator light to show that the desired temperature has been reached. The edge of the cooktop has a slight rim so that the batter does not easily flow over the sides of the crepe maker, and the batter spreader that is supplied along with the crepe maker makes it easy to spread the batter evenly over the cooking surface to get those ultra-thin crepes. Users of the Morning Star have praised its large cooking surface and the way the cooking surface heats evenly so that the crepes are perfectly cooked. Users have also praised the handles on the sides of the crepe maker that do not get too hot, allowing the crepe maker to be handled and moved easily. A small minority of users have complained that the Morning Star may perhaps be overpriced for the quality of the product, but it is also the highest rated by consumers, so we think this is the best crepe machine to buy. The VonShef Crepe and Pancake maker is a perfectly sized appliance. It comes with a nice 12 and a half inch cooktop that makes great crepes, blintzes, pancakes and other batter based foods. The non-stick surface heats evenly and is powered by a 1200 watt heating element. The temperature is controlled by a rotary dial and there is a light to indicate that the selected temperature has been reached. The surface can be wiped clean after use. The VonShef comes with an amazing number of accessories – a batter spreader, an oil brush, a spatula, and a ladle! You will definitely not have to go shopping for additional accessories after purchasing the VonShef. There is a slight rim around the edge of the cooktop to prevent the batter from flowing off the edges. The body differs from most of the other crepe makers reviewed here – it comes in a handsome white finish, which contrasts nicely with the matt black of the cooktop and the dial. Users of the VonShef have been satisfied with its large cooking surface and the even heat control. A few users have remarked on the size of the rim around the cooktop – which is sufficiently high for an experienced chef, but might pose problems for a newbie who might easily let the batter run over the edges. The CucinaPro Cordless Crepe Maker brings an innovative solution to the problem that many beginner crepe-makers face.. How to make a crepe that’s thin but even, one that’s crisp but not overcooked, and that slides easily of the cooking surface rather than sticks to it? The CucinaPro solves all these problems by making the actual cooking surface detachable from the base (hence the “cordless” in the title). The base, which is a handsome white unit, houses the electric connection and needs to be plugged in. The non-stick cooking surface is attached to the handle and can be lifted off the base. To make a crepe, you switch the device on using the on/off switch on the handle, wait for the light (also on the handle) to indicate that the correct temparature has been reached, lift the removable part of the cooker up by the handle, turn it face down so that the hot cooking surface faces downwards, dip it into the pre-prepared batter so that the batter coats the cooking surface evenly, turn it back up so that it’s face up, and place it back on the base. In a couple of minutes the crepe will be cooked, and you can simply pick up the top again and invert it over a plate so that the crepe simple slides off! Users of the CucinaPro have been highly satisfied with the quality of the crepes produced and the ease and speed with which “perfect” crepes can be made. 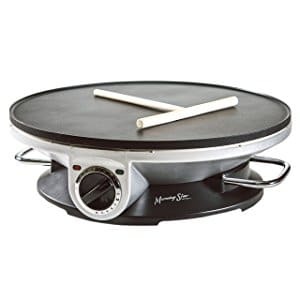 A few users have noted that the size of the crepes are rather small – as the CucinaPro has only a 7.5 inch cooktop as opposed to other cookers that have a 12 inch or more cooktop. Also, the CucinaPro has no temperature control – just an on/off switch – so it’s a device that’s dedicated to making just crepes. A few users have also noted that the “standard” batter recipes cannot be used with the CucinaPro, as the batter may be too thin/runny to work with the CucinaPro – the batter has to be slightly thicker to stick properly to the cooktop when you invert it.